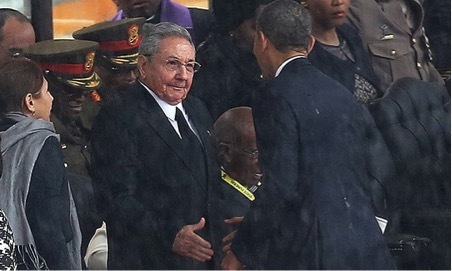 In April of this year, U.S. President Barack Obama and Cuban President Raúl Castro met together in Panama City, Panama, for the first substantial discussions between the countries’ leaders in more than fifty years. 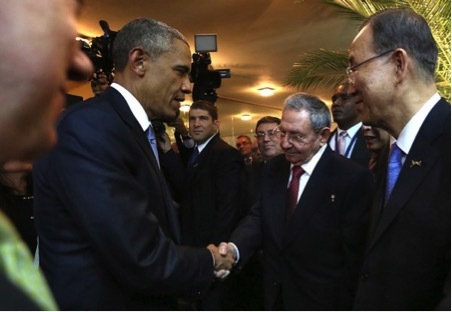 You may have seen that Cuba is in the news once more – this time, because of a handshake full of symbolic meaning. Let’s not forget the last time it happened, surprising the world’s press, at the commemoration ceremony for Nelson Mandela in December 2014. 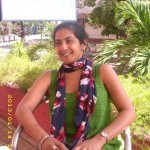 What’s behind the image? Well, more metaphorical handshakes. Let’s just say that there have been hundreds more between Cuba and the US since Cuba’s current President, Raúl Castro, was elected in 2007. 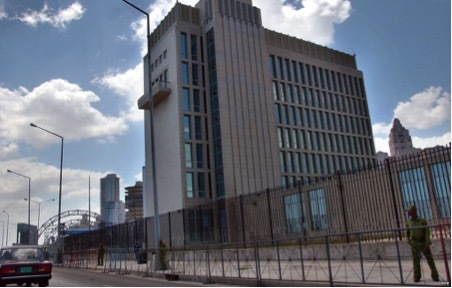 The past few months, in particular, have seen an increased frequency of meetings between leading figures in politics, commerce and culture on both sides of the Florida Straits, with agreements being signed on many fronts, including the reciprocal release of political prisoners and the establishment of a US Embassy, truly and properly, in Havana. Currently, in lieu of an Embassy, there exists the ‘US Interests Section’ on the Malecón (sea front) in Havana. Once again, rather like the Cuba-US relationship, the symbolism of the building and its immediate environment is complex and inherently symbiotic. 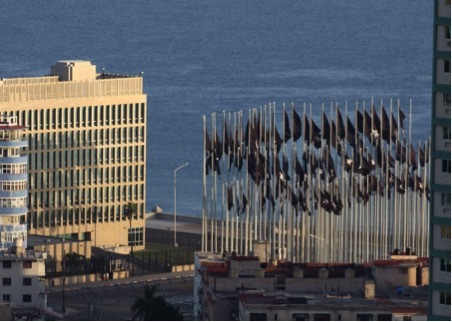 When the US government installed an electronic billboard at the top of the building in 2006, transmitting LED messages aimed at encouraging Cubans to question the revolutionary system and choose US-style capitalist democracy, the Cuban government countered immediately by installing the Tribuna Abierta, a public space for mass rallies and concerts and, crucially, including 138 black flags which symbolised each of the Cubans killed since the end of Spanish colonialism through acts of US-sponsored violence. The flags also served the purpose of acting as a cover, or curtain, for the LED display, or at least sending the message to Havana residents that any public pronouncements about democracy emitted by the US government should always be read through a filter which remembers recent history, and remembers it as violence, both real and symbolic. 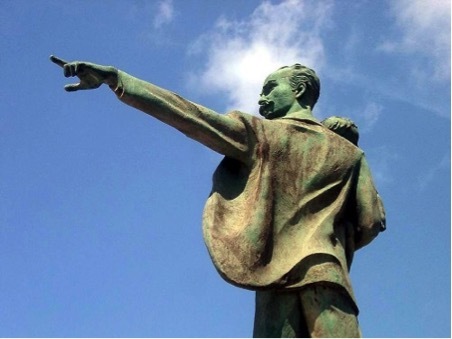 A few hundred yards from the US Interests Section stands a famous statue of the nineteenth-century Cuban patriot, philosopher and statesman, José Martí, acknowledged by Fidel Castro in 1956 as being the intellectual author of the blueprint for the revolutionary project: Martí holds a child in his arms and points across the 90 miles that separate Cuba and the US – whether accusingly or simply reminding the Cuban people of the inescapable presence of their powerful neighbour. Most Cubans resident on the island, whatever their political beliefs, are aware of the impact of US policy on Cuba, not least because of the consequences of that policy: most significantly, the US embargo (the longest economic embargo in world history) which has marked Cuba’s development in infinite and indefinable ways, the Cuban Law of Adjustment which offers Cuban emigrants preferential legal and labour conditions not available to any other immigrant group in the US, and, of course, the continued presence of the US naval base at Guantanámo, now notorious for Camp X-Ray. And Fidel, through his Reflexiones published from retirement, continues to sound a voice of caution, suspicion and political defiance amidst the handshakes. 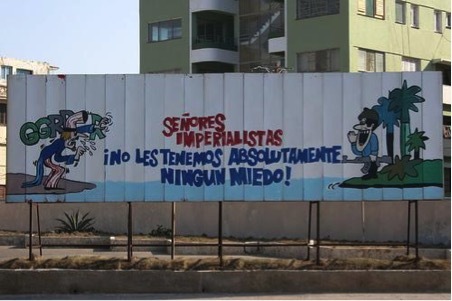 A defiance that is summed up by the provocative billboard near (although not directly in front) of the US Interests Section that claims: ‘Dear imperialists, we are not the slightest bit afraid of you’! Since Raúl Castro was elected to power, however, those moments of Cuban defiance have become less common. Not only because Raúl could never hope to share the single-minded passion and charisma (both loved and hated by Cubans) of his older brother Fidel, but also because his government’s approach is based less on discursive flourish, big ideas and grand gestures than on gradual and logical improvements in policies affecting Cubans on both micro and macro levels. In sum, Raúl’s approach to the process of Revolution is measured, developed through dialogue and collaboration, and inherently practical. But in the handshake – and in Raúl’s speech – at the Panama Summit, we can still see the defiant insistence on national sovereignty and self-determination which has been the hallmark of the Cuban Revolution since 1959. Indeed, the speech is a masterclass in political discourse. It asserts Cuba’s right to have an equal voice in international organisations: Raúl jokes that had Cuba not been excluded by the US and its allies from 6 previous summits, he would have been allocated 48 minutes – instead of the 8 minutes awarded to each leader – and has decided to take his full allocation. It represents a clear gesture of rapprochement: Raúl on several occasions ‘forgives’ Obama for continuing US policy towards Cuba; but he also exonerates Obama by dint of having been too young – or not even born – when much of this policy was first designed and implemented. However, just like the Tribuna Abierta with its filter of flags, the speech also obliges the largely exonerated Obama to listen to a detailed and methodical lesson in the history of US actions towards Cuba since the end of Spanish colonialism in 1898, and obliges us as readers – wherever we are in the world – to learn for the first time, or to be reminded of, that history. In so doing, and despite the eagerness of US businesses and politicians (including the powerful anti-Castro Cuban-American lobby) for political change, and the impatience of Cubans hoping for further economic improvements, the speech is an important reminder that Cuba will proceed with caution in its dealings with the US. Whilst his elder brother revelled in inflammatory rhetoric, Raúl’s slogan, ‘Sin prisa pero sin pausa’ (‘slowly but ceaselessly’) is no less meaningful for the continued survival of the Cuban Revolution and for the preservation of such important ideals as free access to education and healthcare. For more news and commentary about modern languages in the news, we invite you to check out the Reading Reacts section of our blog. For news about the students, staff, and alumni of the Department of Modern Languages and European Studies at the University of Reading, follow this blog, like us on Facebook, and subscribe to our Twitter feed.